Michael Pool put me on notice when I first read Debt Crusher, his first novel. 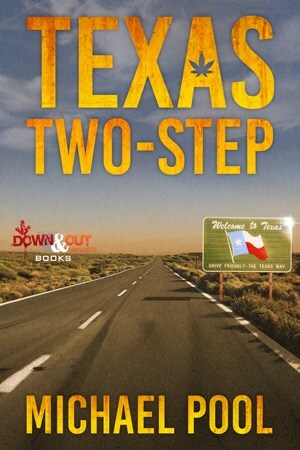 He has lived up to the promise that book offered glimpses of with his newest book, Texas Two-Step. This is a fast paced, wild ride through a drug deal with double crossings, crooked cops, and relationships which are frayed and strained. When Cooper discovers he is about to become a proud father, he is forced to confront the fact the life of following bands around, taking and dealing drugs, and basically living for the moment, need to come to an end. Instead of making a quick exit from that life, he elects to procure one more big weed deal to unload the high-grade strain he has been growing. Going against his better judgement, and the advice of his best friend and partner Davis, he reaches out to an old connection, Sancho. Dealing with Sancho has always meant dealing with additional headaches and baggage, but this time Sancho also brings with him a former NFL bust who is looking to pull a double cross, a crooked sheriff who puts profit above serving the public good, and a pair of law enforcers who are looking to put Sancho, and by extension Cooper and Davis, away for good. This book is about friendship and growing up for the good of all you love and hold dear. But it is also about chasing one last big score, staying ahead of the threats nipping at your heels, and most importantly, keeping the reader invested until the final pages. Pool is set to put the reading world on notice with this one. While not as pulpy as Debt Crusher, he shows he can juggle multiple story lines and flesh out his characters with a keen eye. This book is a hell of a ride and will have you excited about, not only the ending of this book, but the future of Pool. He is poised to make some noise in the noir landscape. I am going all-in on Pool.